Lighthearted Locavore: Goat Stew "Bourguignon"
I made my first goat stew this evening (and with local goat meat) and it was delicious. My husband had been traveling on a business trip and away for three days and this was my welcome home (and romantic) dinner for two. 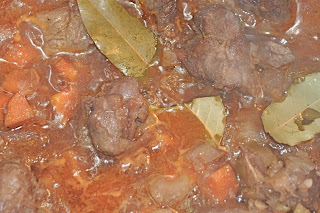 The preparation was reminiscent of a beef bourguignon (think Julia Child but not nearly as complicated) with a nod to traditional Caribbean goat recipes thanks to the homemade pepper sauce. I served the stew with sauteed mushrooms from the farmers market and white rice. Next time I make a stew, I'd will consider pulling out my slow cooker as a slow cooker is a great way to make the ultimate comfort food -- a slow cooked meaty winter stew.